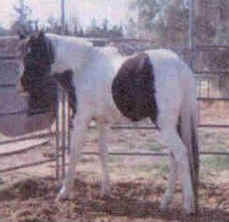 "Scooter" arrived at LCR as a yearling, severely crippled by Epythisits and founder. It seemed we were the end of the line for this beautiful Black & white Paint colt with the big dewy eyes. Our motto "You don't have to be perfect to live here" and the "No kill" rule we live by, has proven to be the perfect haven for him. "Scooter" is an own son of Spookie Do, (homozygous) out of Reed's Love Bird, a Bolo Dee Reed line. He has won the hearts of all who know and handle him. We figured "if he could just earn his keep, we'd be happy." This pretty headed guy has not only has he done that, he has out produced himself over & over, and bred more mares them our other two stallions. He has stamped out 100% color from Paints, Pinto's, Quarters, Arabs, a Morgan, registered mares to unregistered "pets" and 4-H project mares. All but 2 are black and white. "Scooter" passes his beautiful head & wonderful disposition to his foals, and has normally produced a 50/50 color pattern and dark eyes. Obviously he could never be shown, so there are no awards to brag about, but he himself is our own "Blue Ribbon," We won! He won! We can't say enough about this Stallion who was almost put down. He has done more then we dreamed possible. He has lived to improve the foals of the mares he's covered, given the foal owner precious foals at a very reasonable price. Some of his foals are now under saddle, and happy owners are raving about their attitude and willingness, how simple they are to brake & quoting one owner, "my colt was born broke." Owner Jim, loves a challenge and this was it. Scooter will never be a saddle horse, but he is a joy to own and Handle. He is our "teaser", our project, our breeding Stallion & "watch dog," alerting us to any one who enters the property, but mainly letting them know where to bring the hand outs. If you are looking to breed for disposition and brains, Consider Scooter! He's a "Diamond in the Rough" and is doing his job, and doing it well. Breeding at Private Treaty. Consideration to 4-H and show homes.